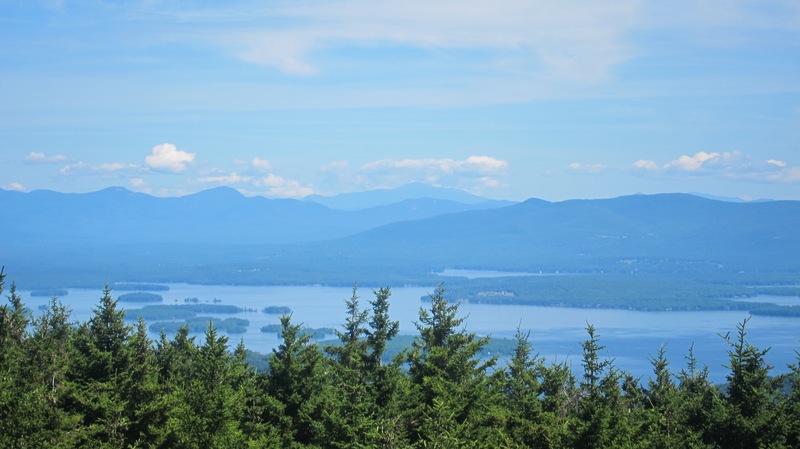 Tuesday, August 6, 2013 couldn’t have been a more perfect day to hike to the summit of Belknap Mountain, a small peak I can easily see from the rear deck of my home. The temperature not too long after sunrise was just under 50 F, the wind was light to calm, and the humidity was low. It was a shorts and polyester t-shirt day for sure. Here’s the gear I carried to the summit. 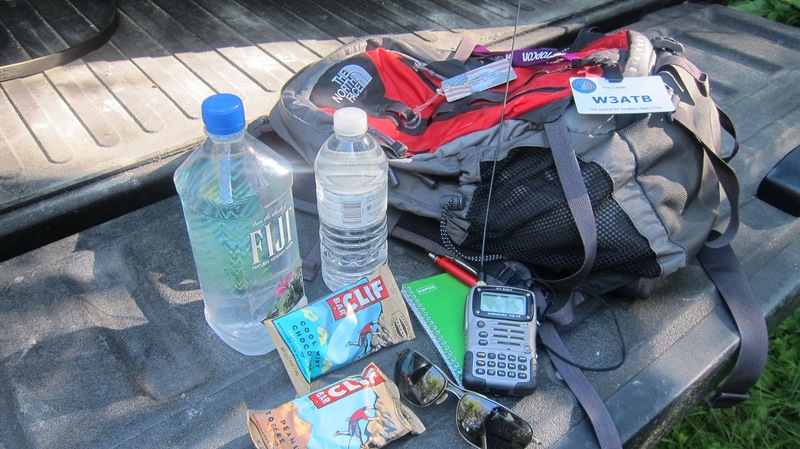 Much needed water, nutrition, radio, notebook and pen and sunglasses. More clothes were in the backpack. I planned to hike with my friend Hal Graham. He’s a lifelong hiker, and he and his wife Peggy have pretty much adopted Belknap Mountain as their primary hobby. 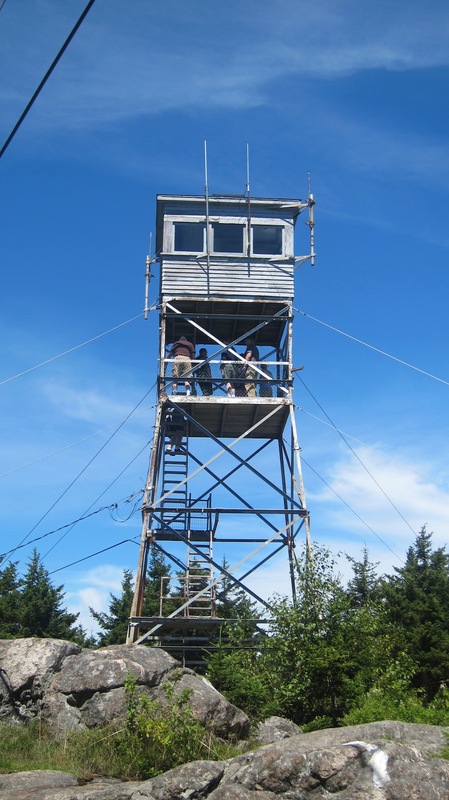 Hal works part time for the NH Forest Service as the Special Deputy Fire Warden and lookout watchman when he mans the fire tower at the summit of Belknap Mountain during periods of extreme heat and drought. He’s also the founder, president and trail crew leader for the Belknap Range Trail Tenders (BRATTS). This group of volunteers does the trail maintenance on Belknap and surrounding mountains. What better expert to lead the way to the summit! I love to hike, but I don’t treat myself to the pleasure as often as I should. On this day I was combining two hobbies as I wanted to complete my first Summits on the Air (SOTA) activation. SOTA is an ideal way to blend two fulfilling hobbies as I was about to discover. Earlier in the morning I had visited the SOTA website to alert the world, yes the world, that I was going to be on top of Belknap Mountain at a specific time. Talking to Hal he said we’d be at the top by 9:30 ET or 13:30 UTC. Using the SOTAwatch2 Alerter, you tell other ham radio operators that you’re going to be reaching out at a specific time to make radio contact with them. Because of the wonder of ever-shrinking electronic components it’s possible to talk around the world to other people using a radio that can fit inside an Altoids mint can! These small radios are best suited for Morse Code, but there are also small radios that allow you to talk to other hams around the world. One of these radios that’s quite popular is the Yaesu FT-817ND. The more sophisticated radios that allow both Morse Code (CW) and voice (technically called phone by hams) transmitting are about the size of medium hard-cover book. This is but one reason why you want to invoke the power of the SOTAwatch2 system. If you plan to do high-frequency transmitting that will go thousands of miles, it’s very possible you could create a pileup of hams wanting to communicate with you. Pileups are frequent if you’re scaling a particularly difficult peak. 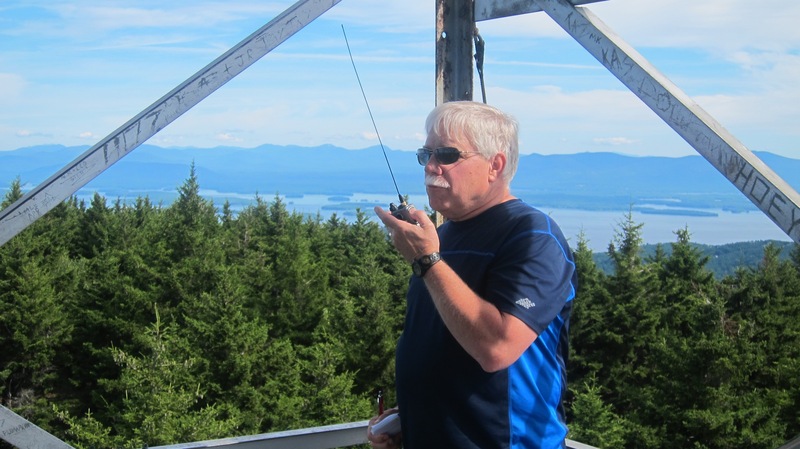 If you participate in SOTA, you can score points by climbing a mountain and making contact with four other radio operators. The simple guidelines explain exactly what you have to do. There are long official rules as well at the SOTA website. You see, not only is it possible for you to score SOTA points should your activation be successful, the chasers – the ham radio operators you communicate with on the ground or other peaks – also get points. It’s not uncommon to have a pileup of hams trying to connect with you so they can enter the contact into their SOTA logbook. Are you starting to see why this might be fun? Hal and I arrived at the trailhead about 8:15 ET (12:15 UTC) and he showed me a nice vista point adjacent to the parking lot. Within minutes we were on our way up the blue trail that’s a little over one mile long. I was stoked and itching to get to the top. We took our time and stopped occasionally to look at improvements to the trail Hal had done personally or had supervised. Hal told me all about trail maintenance tricks and the need to relocate the trail from time to time to make it safer. In certain places the old trail crossed exposed bedrock which can become very hazardous in wet or cold weather for those coming back down the trail. 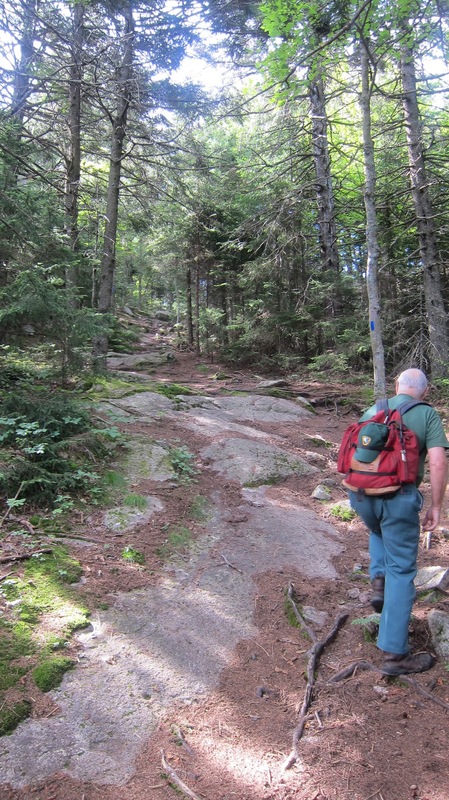 Hal Graham leading the way up the Blue Trail to the summit of Belknap Mountain. Note the exposed bedrock. Time flew by as we put one foot in front of another making constant progress up the mountain. This being my first time up Belknap Mountain I had no idea at any time how close we were to the summit. Belknap is not high enough to have a tree line. This means trees exist at the summit, so you can be quite close to the top and not really know it. At 9:30 ET (13:30 UTC) I became a little concerned because we had not yet summited. I had told the world and my local ham club members I’d be on the air at 146.520 Mhz at that time and didn’t want to let them down. “How close are we?” I asked Hal. “We’re just five minutes away,” Hal exclaimed. “CQ CQ from W3ATB,” I spoke into my Yaesu VX-7R. It instantaneously transmitted that at 5 watts using a quarter wave whisker-thin antenna out to the world. “W3ATB this is KB1RJD. You’re 5 over 9,” responded Merle from approximately 34 miles away as the radio waves travel! Merle and her husband Herman are ham radio operators who live up near Mt. Washington in Madison, NH. I’ve worked with them at various public service events. I was thrilled to hear someone on the radio! Maybe, just maybe, there would be others so I could get my single point for activating Belknap Mountain. Hal and I then took off, me with radio in hand, to get to the fire tower at the summit of Belknap Mountain. Sure enough, we were there in no time. Little did I know it but there was a minor pileup waiting for me to begin transmitting once more. If you climb up three flights of steep, narrow steps you can get to a magnificent viewing platform that’s just below the working part of this active fire tower. The view was stunning, the sun was warm, I was out of breath from the sprint to the fire tower and the thrill of wondering who might be out there to talk to. Here’s the Belknap fire tower. You can see people that crowded the platform where I did my SOTA activation. They came up after I was finished. I quickly set down my red and black Northface day pack, got a quick swig of cool water, fished out my notebook and pen and got to work. BOOM! Let the pileup begin! WOW! I had my first successful SOTA activation. All I had to do was transmit using non-commercial power – my handheld radio is battery powered, carry all my equipment myself, and communicate using a simplex frequency to at least four other ham radio operators, none of which could be on the same summit with me. I looked at my watch and lo and behold twenty-five minutes had gone by in an instant. Hal was busy opening up the fire tower while I was on the air. He also snapped a photo of me in action. That’s one for the history books for sure. I basked in the brilliant sunshine gazing down at the Mt. Washington as she sailed south from Weirs Beach towards Alton, NH on the placid waters of Lake Winnipesaukee that lap up against the base of Belknap Mountain. How lucky was I to be at that spot to enjoy the vista and start my SOTA journey! “Get up here and really take in the view,” Hal piped up knowing the radio had gone silent. Part of the panoramic 360-degree view from the summit. Mt. Washington is the tall peak in the center of the photo. After taking a deep breath I climbed the last flight of steps up into the fire tower. It was steeped in history and loaded with communications gear, ancient topo maps, small tables and even a tiny microwave oven! I decided to look to the north northwest trying to see my own home. It had to be there. Sure enough I spotted the thin light-brown strip of the Waldron Bay beach dipping its toes into Lake Winnisquam that’s just north of my home. It didn’t take long to work my way south along the shore to spot my dock and a tiny sliver of yellow that was the painted siding on my home. I couldn’t do this with my naked eye, I had to use Hal’s powerful binoculars and the ancient monocular telescope that’s used to pinpoint the azimuth of a fire. Soon it was time to head back to the trailhead. We decided to walk back down the white trail. 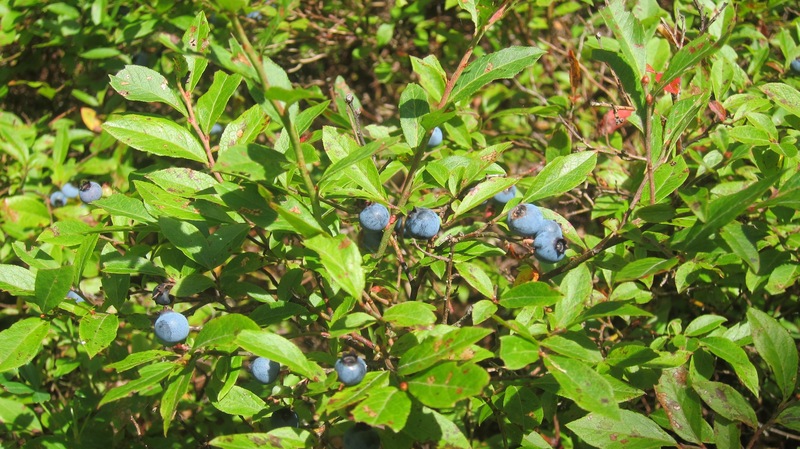 It was a great choice as along the way we walked by several spots where blueberry bushes provided us with a much-needed tasty snack. We made sure to leave some for other hikers and the local bears. Mother Nature provided a tasty snack on the way down. Thanks Mom! I love you! If you’re looking for a nice hike and a 360-degree unobstructed panoramic view of the NH Lakes Region, Belknap Mountain is the place. Climb up to the open observation platform of the fire tower and soak it up with your soulmate if you can get her/him to hike with you!